OBV5-B,C series Surge Protector is applicable for B,C grade lightning-proof and suitable forTT, IT, TN-S, TN-C-S etc. power supply system of AC50/60Hz, 380V, installed on the joint of LPZ0A zone or LPZ0B and LPZ1 zone, which protects the electric device not shocked by the thunder and lightning. 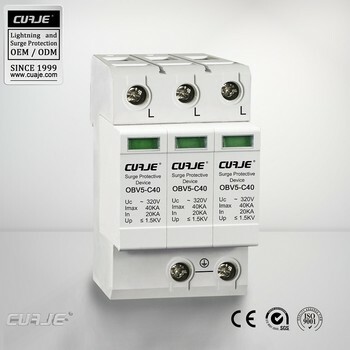 These series usually installed in household distribution boards, computer equipment, information equipment, electronic equipment and in the socket box in front of control equipment or near the control equipment.